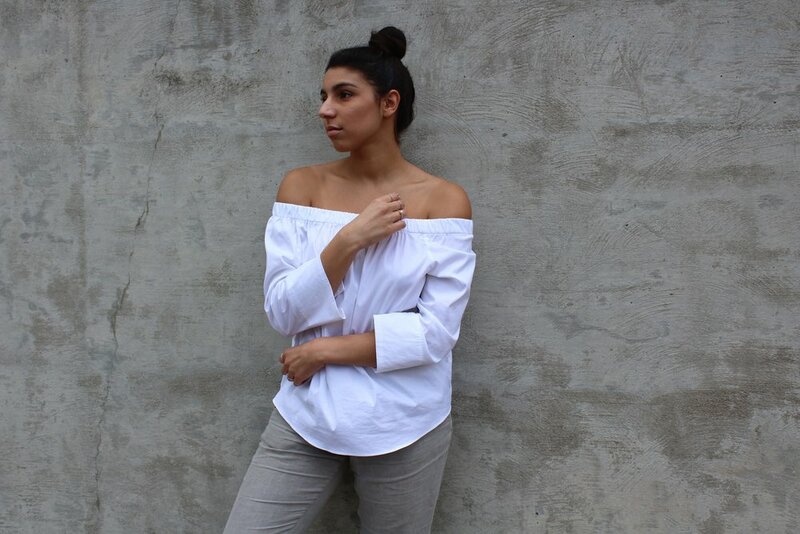 As you can see, I've partnered with ThePeachBox to share a couple of my favorite pieces from their latest collection! It's no secrecy I love silver jewelry, so I was happy to spread the word about this super chic Marc Bale Silver Crystal Watch and silver Roman Empress bangle. The work so well together and are timeless pieces! I'm a huge fan of the layered minimal jewelry look, so these pieces together mix with my current jewelry collection so well. I can truly say that ThePeachBox supplies some of the best modern looking jewelry at amazing prices. I definitely recommend checking them out for your jewelry layering needs! Use code claudiadicapua for 15% off on ThePeachBox.com! Let's dive into this look and how I styled around this watch and bracelet. With both pieces of jewelry being minimalistic, simple and elegant pieces, I wanted to create a look that complemented that simplicity. Also, these accessories are super comfortable, so of course the look had to match! For my own sake. A rule of thumb for me when try to make a casual look feel more put together is throwing on a blazer. A simple blazer like this H&M one isgreat for summer and looks effortless over a t-shirt or blouse. Personally, I like them over t-shorts because it gives the look that street style vibe. This is why I paired the blazer with a simple linen top from Madewell. They have the softest, comfiest tees! You probably remember these jeans because I wear them so often! I found these babies on sale on Revolve by Lovers & Friends. The quality of denim is so high and they sit perfectly on my hips (not to low or high). I've decided that having a lot of cheaper low quality jeans is not worth it. Investing in higher quality jeans makes them last longer and you'll probably like them longer as well. I'm super excited about my latest collaboration, guys! I love accessories, so that means watches. Ally Denovo is a Switzerland based watch company that has nailed the art of creating modern and fashion forward timepieces while keeping them at a reasonable price. Who doesn't want that?! We all are so use to looking at our digital devices to tell time, but Ally Denovo is giving us all a reason to embellish our wrists with watches again. Not only does this watch serve the function of telling you the time of day, but the styles and designs will only enhance your accessories game. Layering these watches with simple bracelets or adding a few rings brings your look to a whole new level! As you can see above, I rounded up a bunch of my favorite styles from both there latest and previous collections. I love the simplicity and personality that comes with each watch. It's no surprise that many of my favorites feature a marble face, but I'm also obsessed with the mesh styles. Both the silver and rose gold mesh options are sure to give your arm candy some serious luxe vibes! Of course, my overall favorite is the Carrara Marble Silver, which is shown in the larger photo above. I'll be posting how I style a watch like this within a week, so keep an eye out for it! I linked all of my Ally Denovo picks above. Happy exploring! Pura Vida Bracelets is a company that not only makes awesome jewelry, but also contributes back to society. Every purchase made helps to employ an artisan in Costa Rica. The jewelry is of high quality and I know that sliding adjusters on the side of the bracelet will hold up for a long time. Pura Vida makes several different styles of bracelets including their originals, charmed, beaded, braided and so much more! 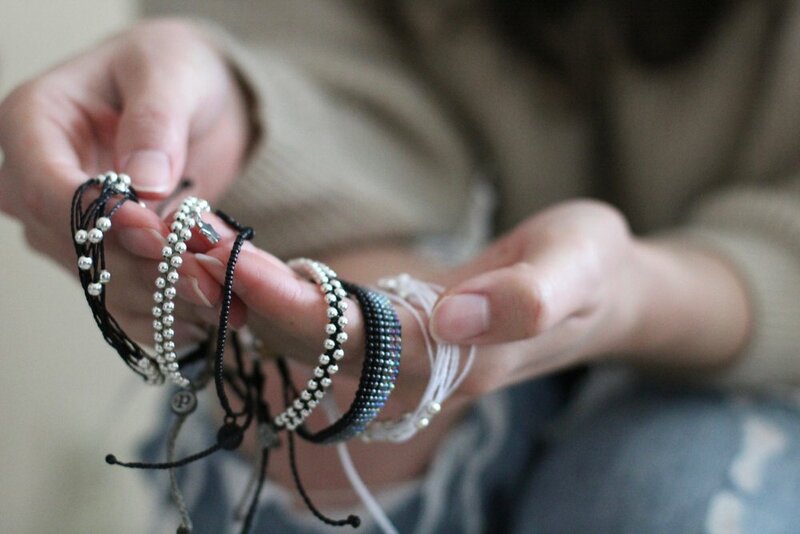 They even have stacking packages and options, which helps you to see which bracelets look good together. See a few of my favorites below along with how I styled them. The drawstrings on the bottom of each bracelet make adjusting the size very easy. Not only are they great for stacking and adding some depth to your jewelry, they are super functional too! 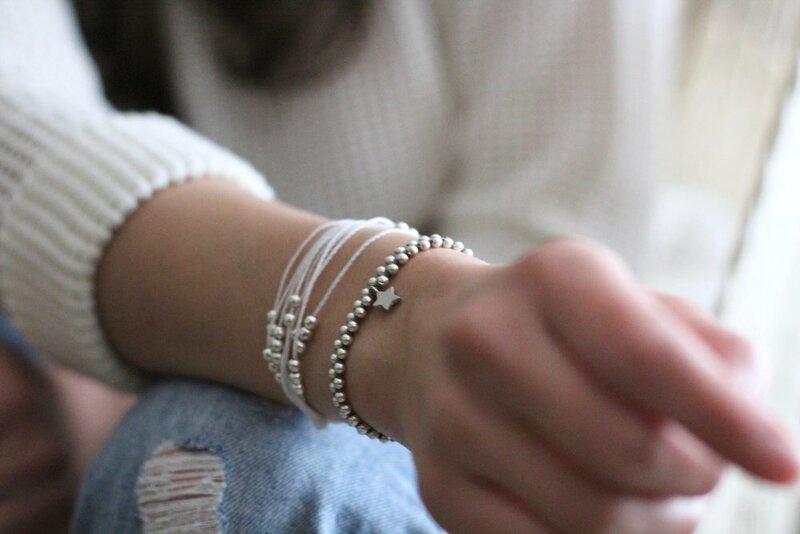 My favorite definitely have to be the silver beaded bracelets. They are great for layering together and with other jewelry! Visit puravidabracelets.com for more bracelet styles! Nishi Pearls and I collaborated to give you guys an awesome giveaway opportunity! The winner of this giveaway will receive a beautiful piece of jewelry from Nishi Pearls, just like the pearl and silver ring I am wearing in the photos. The quality of their products is amazing and the simplicity makes all of the jewelry an everyday staple. See below for how to enter! All steps are optional (but recommended), besides the first one. The more of these steps that you complete the more entries you get with your names on it. That means your chances of winning increase! As you can see, there is some serious detail going on in these pieces. I love that they look timeless and perfect for layering! Definitely enter this giveaway to get one of these babies for free! Click on the image to be directed to wear to purchase. Iosselliani has been one of my favorite jewelry brands for as long as I can remember. I love these earrings… they have a vintage Americana vibe .They’re bold but wearable with the right amount of courage. The perfect building block for any 4th of July ring stack. A great carry-all that’s colorful and beach friendly. I’m 5’4, so I always need a little heel. The white is perfect for the summer months and the metallic detail gives any outfit a hint of edge. What the hat said… Relax and enjoy the sun! Special thanks to Olivia Perez of Friend of a Friend for guest writing for my blog! Her style advice is always welcome on my site. Check her out at frndofafrnd.com! It's GIVEAWAY time (again)! I've partnered up with JQ Vancouver for the second time to give one of you an amazing necklace of your choosing because of the great response we got from the last giveaway! Head over to my Instagram (@TheFashionAttraction) and JQ Vancouver's Instagram (@jqvancouver) later today for how to enter! This is probably my favorite necklace from the whole collaboration! You may remember this necklace in gold from our original collab, so it can't come as that much of a surprise. It's so light and looks effortless. I find it is styled best with a lower v-neck neckline. It combines the cool lariat look with a layered lightness. This is by far the most versatile necklace of the bunch! I wore this necklace as a choker, long, loose and even as a bracelet. It was perfect for all of those street style looks that needed to be spruced up with pretty jewelry! Exchange the heart for a triangle and the 2 layers for one, and you have the silver triangle necklace! It's essentially more of a lariat and perfect if you are into the less is more/minimal aesthetic. I love this piece and honestly, it comes down to mood when I'm choosing between wearing this necklace vs. the layered heart necklace. The gold bar necklace is perfect against a contrasting shade like white or black. I wish I was a bit tanner in this picture, but the clothing you choose to pair with it definitely makes a difference! It's simple and elegant. If you aren't into the long necklaces, this is for you! Shop all Rumba Time watches at rumbatime.com and find my outfit information from this post under the lookbook tab! This timepiece is as classic as it gets. The leather bands are a simple black that helps me to style this with many looks, but what really pops is the rose gold. Most people usually gravitate towards the yellow gold or silver look without even considering rose gold. This could be because maybe you don't have enough jewelry to match it. If you own yellow gold jewelry, you have something to wear with it! These two golds complement each other well. The watch comes in various textures and colors aside from my Soho leather version. The face of the watch is also either gold or silver on the suede versions while my leather watch is rose gold. I love how large the face of the watch is because it helps it to really stand out and catch the light. I wanted this look to be a bit edgier and to play around with textures, which is how I managed to put all of these different pieces together. No surprise that everything is black! By wearing all black, (besides the fact that I love it), the rose gold of the watch was able to pop in contrast to the clothing. The black band of the watch helped me to maintain that edgy look that I was going for. Also, because it is a leather band, the watch complemented my leather boots, zipper on the jacket and bag nicely. There was an obvious texture trend throughout the look, which is leather. For a layered look, try adding a mix of yellow gold and rose gold jewelry! TO FIND OUT MORE ABOUT MY CASUAL CHIC LOOK AND WHERE TO BUY EACH ITEM, PLEASE VISIT THE LOOKBOOK PAGE!